Doyon Foundation will be closed Wednesday, January 1, 2014 in observance of the New Year’s holiday. Offices will reopen Thursday, January 2, 2014. Have a safe and happy new year! It’s Not Too Late… To Nee Ts’ee Neeyh! There is still time to make a tax-deductible gift to Doyon Foundation in 2013 – and make a big difference in the lives of students in 2014! By making a contribution, you will join a special group of donors – our Nee Ts’ee Neeyh donors. Nee Ts’ee Neeyh means “we all give or help” in Koyukon Athabascan. Nee Ts’ee Neeyh donations benefit our general scholarship fund, which awards basic scholarships to full-time and part-time higher education students. Learn more about our Nee Ts’ee Neeyh giving program, or make your secure online donation by midnight tonight! Thank you, and Happy New Year from all of us at Doyon Foundation! Have you ever considered a career in law enforcement? Doyon Foundation is pleased to announce a scholarship opportunity available to all Alaska Native students wishing to attend the spring 2014 Law Enforcement Academy at the University of Alaska Fairbanks Community and Technical College. The next academy will be held February 17 – May 16, 2014 in Fairbanks, Alaska. Three $6,800 scholarships, generously funded by the Alyeska Pipeline Service Company Alaska Native Program, are available. All Alaska Native students are eligible to apply. Applications must be received by Friday, January 3, 2014. For more information on the academy, visit www.tvc.uaf.edu/programs/lawacad/. To apply for a scholarship, visit the Foundation website to download the application. For more information, contact Doyon Foundation at 907.459.2048, 1.800.478.4755 or foundation@doyon.com. Language revitalization program proposals will be accepted for the 2014 Doyon Language Revitalization grants until Friday, January 31, 2014 at 4:30 p.m. The purpose of the program is to promote and teach interior Alaska Native languages through learning programs developed by the applicants. For more information and the application, please go here. Please note: This grant is not administered by Doyon Foundation. Contact Colita Fiorenzi at Doyon, Limited by email: fiorenzic@doyon.com or phone: 1.888.478.4755, extension 2016 or 907.459.2016 for more information. This is a reminder to students who received a Fall 2013 Doyon Foundation scholarship and applied for the Spring 2014 scholarship. If you completed your scholarship application by the deadline and were a fall 2013 scholarship recipient, it is required that you submit your unofficial transcripts showing final fall grades by Friday, December 27, 2013. You can email them to foundation@doyon.com or send them to Doyon Foundation, 615 Bidwell Avenue, Suite 101, Fairbanks, Alaska 99701. Please note that if you are not a returning student (did not receive a fall 2013 scholarship), you were required to submit official transcripts by November 15, 2013. Transcripts that are unofficial or received after this date from non-returning students will not be accepted. For more information, see Doyon Foundation’s scholarship application guidelines at www.doyonfoundation.com or contact Maurine Isaacson, Scholarship Program Manager at isaacsonm@doyon.com or (907) 459-2048. Happy Holidays! Seeing students learn and grow and eventually transform into leaders who touch lives and lead positive change is one of the remarkable things about being involved with Doyon Foundation. Foundation alumnus Dewey Kk’ołeyo Hoffman is an excellent example of the power of a scholarship. Dewey graduated high school in Anchorage through GILA City Schools and APU Early Honors Program simultaneously in 2004. 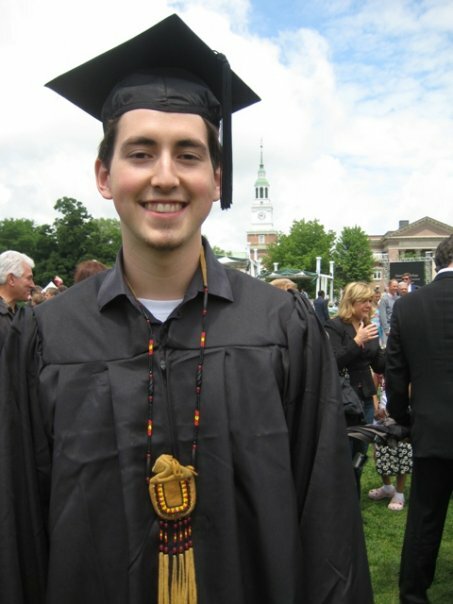 He completed his undergraduate degree at Dartmouth College in 2009, with lots of encouragement and inspiration from his family – including his parents and two older sisters who finished college ahead of him. He also received support from the Native Americans at Dartmouth student group, professors and Doyon Foundation, which awarded Dewey numerous scholarships during his education. “Although I wanted to quit many times, seeing who had gone ahead of me and what encouragement and insights I might be able to pass on to others kept me going,” Dewey shared. Today, Dewey is finding lots of ways to pass on the things he’s learned. He is coaching his 8th grade nephew as he prepares to enter a post secondary degree of his choice. Dewey serves as the development manager at the Alaska Native Heritage Center, supporting its mission to preserve and strengthen all Alaska Native traditions, languages and art. 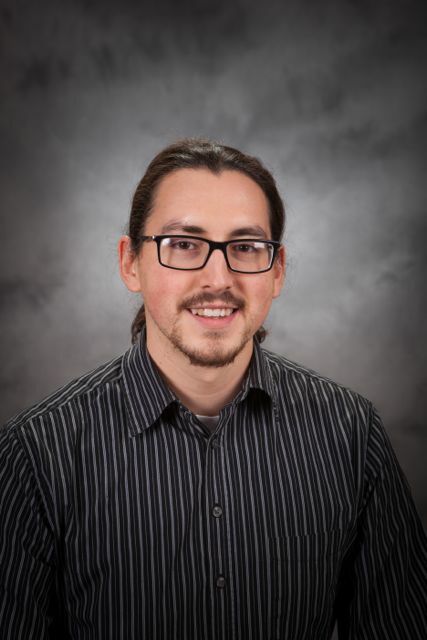 And he is seeking a master’s degree in education, focusing on teaching and learning, and promoting education policies and reforms that will create more opportunities for Alaska Native language instructors. “When you donate to the Doyon Foundation, you are not only supporting the current and upcoming generation of Alaska Native leadership that will directly steer us into the future, but the state of Alaska as a whole,” Dewey said. Dewey is Koyukon and Swiss-American originally from Ruby, and is the son of Dee Olin and David Hoffman. His mom was born to the late Lillian and Fred Olin of Kokrines and Ruby, and was adopted by John and Lorraine Honea of Ruby and seasonal camps. His father’s family comes from a farming community near Bozeman, Montana, where his ancestors from Switzerland and the UK settled. If you would like to help pass on the power of a scholarship, please consider supporting Doyon Foundation with a 2014 Pick. Click. Give. contribution. Starting January 1, you can Pick. Click. Give. 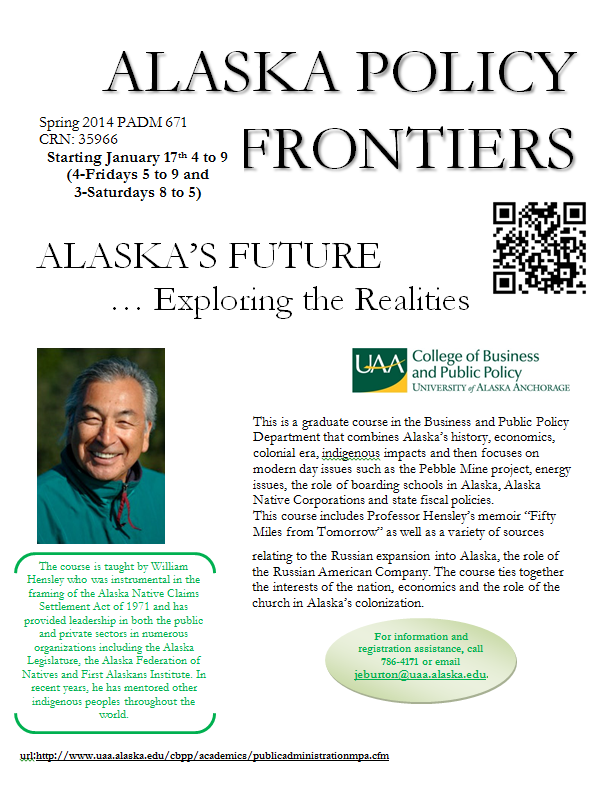 to the Foundation when you apply for your 2014 PFD at www.pfd.alaska.gov. 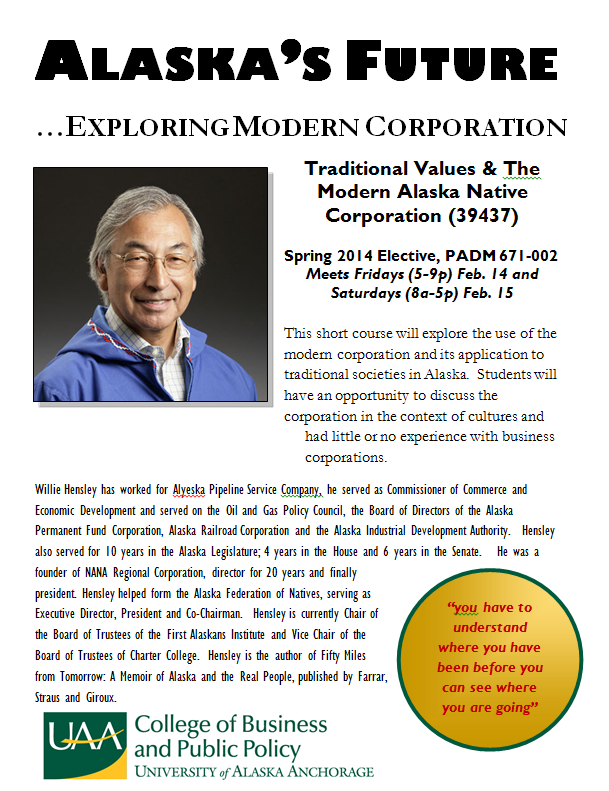 UAA will be offering two courses this Spring 2014 semester covering traditional values and the Modern Native Corporation. Attached are two flyers with the course descriptions.